Eleven large wildfires are burning in the U.S., with most of them centered in the Southwest. The largest, the 416 fire in Durango, Colorado, has grown to almost 17,000 acres. Over the weekend, parts of Colorado were approaching record heat with windy conditions providing a perfect set-up for wildfire growth. Today, the fire danger decreases as cooler conditions and less wind move into the area. 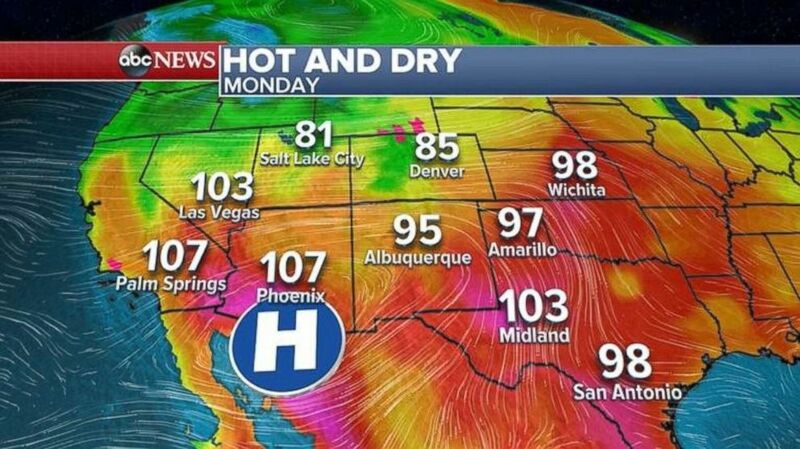 But many areas in the Southwest remain very hot. Temperatures are in the high 90s and over 100 in many areas across the Southwest. There were more than 200 damaging storm reports from the Plains into the mid-Atlantic on Saturday and Sunday, including three reported tornadoes in Iowa and Illinois. Also, more than 5 inches of rain fell in just a few hours from Iowa to the mid-Atlantic, with flash flooding in areas like Philadelphia. Heavy rain will move out of the mid-Atlantic on Monday, but more severe storms are expected in the Midwest. 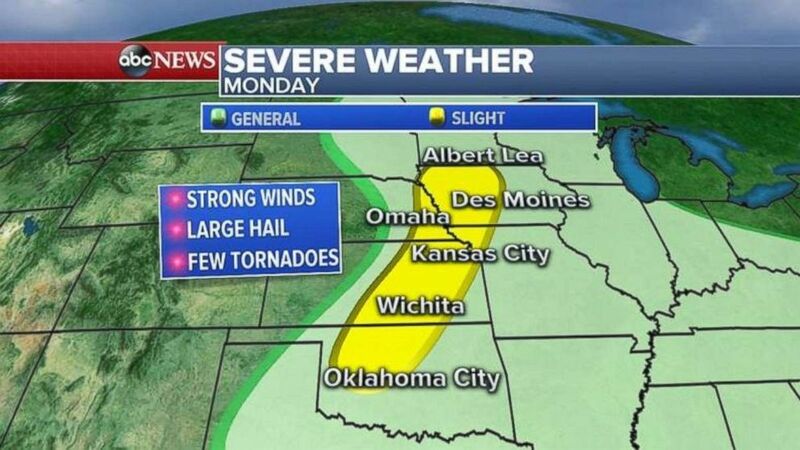 A threat for severe weather exists from central Oklahoma north to Iowa on Monday. The biggest threat for damaging winds, large hail and tornadoes will be from Minnesota to Oklahoma.